Wash cranberries and drain well, removing any stems and damaged or soft berries. 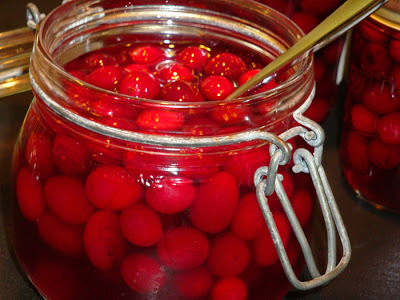 Place the berries in a small heat-resistant bowl or a glass canning jar. Berries should be room temperature. In a medium saucepan, over medium-high heat, bring water, sweetener, brandy, and salt to a boil. Boil for a few minutes to drive off some of the alcohol, if desired. Pour boiling mixture over cranberries. Place a small plate or weight on top to keep berries submerged. All the berries should split after a few minutes. If any do not, drain off the liquid, reheat, and repeat the process. Let stand until room temperature. Cover and refrigerate overnight or 8 hours. 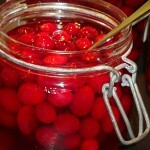 Store in refrigerator or fill jars and process in a water bath as for canning.